Within the next couple of days we are going to be bringing the much overdue wheeling neighborhood section to CF. However we are at loss regarding how to divide up the regions. I would like to see about 10 divisions. What do you guys think? How should they be divided? Please list the divisions along with what area they cover so we can start getting some ideas and putting some stuff together. Hmmmm that is tricky no matter how you do it someone won't like it lol. I mean you could always copy "the other jeep site" since alot of us frequent there also. The one thing I would change about there regions is Overlapping regions. People in border states can choose one region over another. This is my initial thoughts. Canadians can have there own group or can fall in with neighboring states. Yes I was thinking about you Craig! 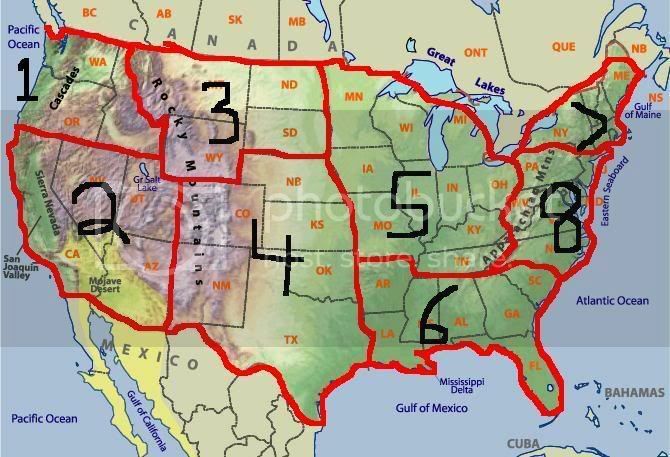 My map only show 8 regions. So there is room for improvement. Thats a good start, anybody else have any ideas? New or branched off from strykers idea. then upload it to photobucket and post your ideas. What do you guys propose we call each section? I like everything except BIG. 2 should probably be south west. and 5 I assume you ment mid east? Area 4 could be South Central Region. Good call, any additional suggestions guys? Bring any idea you have forward please. Not a suggestion but a question. What purpose are these sections going to have. Is going to be regions for activity or M & G or what is going to be the main purpose. Its designed for CF activities to be coordinated, as an example if you were going on a wheeling trip you would advertise it in the appropriate section and see if other CF members want to come. Similar to that of other boards alike. No 5 i meant midwest. it contains st. louis which is the gateway to the west.